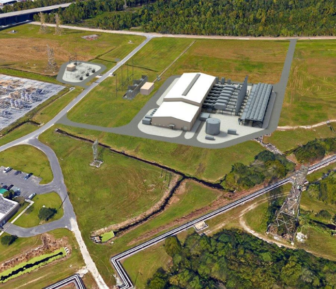 An illustration of Entergy's proposed power plant at the Michoud site in eastern New Orleans. Last week, the City Council announced it would convene a special meeting to consider a resolution to rescind its March 2018 approval of Entergy New Orleans’ proposed power plant in eastern New Orleans. The resolution, originally scheduled to be heard this week, has been rescheduled to February. 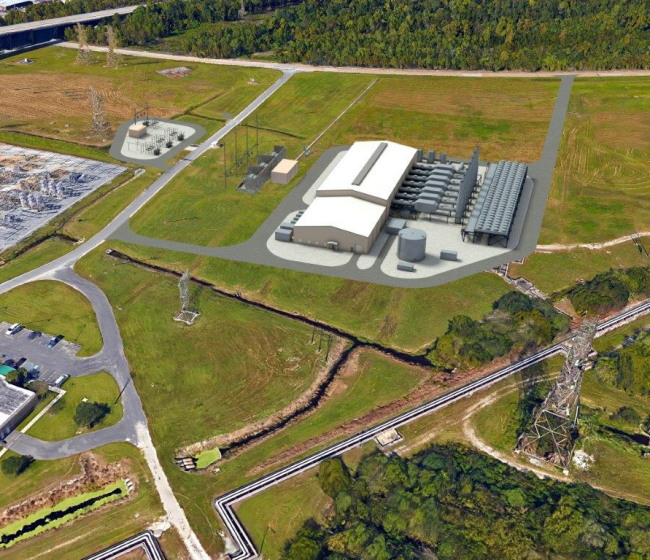 An illustration of Entergy\’s proposed power plant at the Michoud site in eastern New Orleans. But that wasn’t the only development last week that could put the $211 million plant’s future into question. In recent state filings, two groups opposed to the plant said Entergy New Orleans botched its application for an essential state permit. But an official from the Louisiana Department of Environmental Quality, the state agency handling the permit application, told The Lens that what the groups characterize as a “failure” is actually fairly typical for permit applications. In an interview, he indicated that it may not be enough to trigger a revocation. The company applied to renew an existing air quality permit — required for major sources of emissions under the federal Clean Air Act — at the eastern New Orleans site where the new power plant is being proposed. But last week, lawyers representing the Alliance for Affordable Energy and the Deep South Center for Environmental Justice — groups that have separately filed suits to overturn the council’s approval vote — sent a petition to the DEQ saying that Entergy failed to submit a complete application before a 2018 deadline, omitting at least one key emissions projection. As a result, their petition says, Entergy can’t renew the permit, which it needs in order to build and operate the proposed gas plant. “[The Louisiana Department of Environmental Quality] does not have the authority to issue a renewal of the air permit to Entergy,” it says. The proposed plant would be constructed on the same site where Entergy operated the Michoud plant from 1956 to 2016. The air quality permit for the old plant — known as Part 70 Air Operating Permit — expired on Dec. 11, 2018. Instead of applying for an entirely new permit, Entergy is attempting to simply renew the old one. But lawyers Monique Harden and Susan Miller argue that the company lost that opportunity by bungling the application process. The original permit was set to lapse “unless a timely and complete renewal application has been submitted six months prior to expiration.” That gave Entergy until June 11, 2018. Entergy did submit a renewal application well ahead of that date, in 2017. But on July 27, 2018 — more than a month after the deadline — the company added 37 pages of additional information to its application. Among the changes were four new types of pollutant emissions that were absent from the original application, as well as increased emissions for four others, according to the petition. The biggest change was in ammonia emissions. According to the petition, ammonia was completely left off the original permit. In the updated version, Entergy projects that the power plant will release 8.61 tons of ammonia emissions each year. “The significant changes made by Entergy demonstrate that its permit renewal application was not complete when it was submitted to the LDEQ in August 2017,” the petition says. In its July 27 filing, Entergy said the new information was “based on recent vendor and… contractor reviews and communications.” Harden and Miller argue that this information could have been available to Entergy earlier, prior to the 6 month window. Bryan Johnston, the Air Permit Administrator for the Louisiana Department of Environmental Quality, said “it’s not unusual” for applicants to add supplementary information after the initial submission. “It is customary for permittees to supplement an application after the initial submittal,” he said. But Miller argued that this was different. The changes were at least large enough to prompt the department to reopen public comment for 30 additional days in August 2018. “I think it’s fair to say that LDEQ recognized that the increase in ammonia warranted additional public input,” Johnston said. Johnston couldn’t point to prior department rulings that could shed light on precedent for this situation. But the petition highlights one example that indicates that the DEQ, without intervention, isn’t likely to reject Entergy’s renewal based on the timing of the application. Entergy did not respond to a request for comment on this story. The permit application in question is actually Entergy’s second attempt. The first was submitted in March 2016, more than two years before the air permit was set to expire. The petition points out that the application wasn’t rejected by the Department of Environmental Quality, even though state regulations prohibit permit renewal applications more than 18 months in advance of expiration. “I’m troubled about the pattern of LDEQ’s lax enforcement which, if not corrected, places Entergy above the law,” Harden said. She argued that if the renewal is granted, the Department of Environmental Quality will have overstepped its legal authority by violating its own regulations. The City Council resolution that approved Entergy’s application for the plant stipulated that the company couldn’t begin construction until it obtained the proper permits from the Department of Environmental Quality. So if Entergy’s renewal application is denied, the company will need to apply for entirely new permit, which is a much more difficult process, Miller said. In a permit renewal process, the plant’s emissions would be judged in comparison to the emissions of the prior plant. This makes the new plant look like a reduction in emissions, since the old plant was built in the 1950s and had more than five times the generation capacity of the new plant. If Entergy is forced to apply for a brand new permit, the plant’s emissions would be viewed as net increases in the region, Miller said. Johnston said that the department would respond to the petition, but could not provide a timeline. He also said that a decision on the renewal application itself was taking longer than usual due to the high number of public comments they received. He said the department is required to respond to each comment before issuing a final ruling on the renewal. He could not say when the department expects to announce that decision. Moreno seeks to boost in-house staff, reduce council reliance on outside contractors.